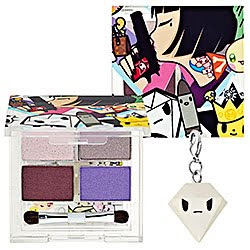 Diehard Tokidoki junkies rejoice, for Sephora has given us beauty lovers our very own dose of kawii with their newest cosmetic collaboration. Browsing the products has me positively giddy with excitement, and I spot at least ten thousand (ok… maybe three) things that I must have immediately. The rest will come in time. A girl could never have enough purple eyeshadow quads, and this particular set looks exquisite. From the adorable diamond (diamante, get it?) charm dangling from the palette, to the stunning array of colors that promise to pack a pigmented punch, can you say charge it? 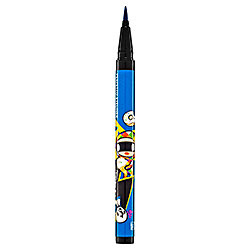 The divine makeup deities have been listening to my wishes apparently, as they have created a waterproof eyeliner pen in living color! I adore pen liners, and need every.single.color in my life. With a formula that boasts it could lengthen, thicken, and layer well, these mascaras had me at hello. 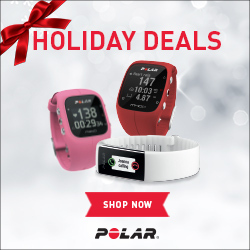 Again, we need to discuss the color quotient here, as these look vibrant. Purple, green, and blue, come to mama! 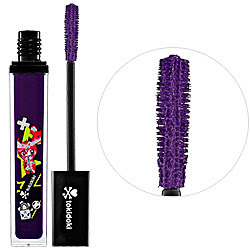 Have you had a chance to browse Tokidoki for Sephora? If not, what the heck are you waiting for? Goooo!